The tile at this doorway needed to be removed during floor prep. We painted the room first. Consider It Done installed this flooring in the kitchen, dining room, living room, entry, and hallway. One more piece of wood along the bottom, and this deck replacement is finished. This old house needed a new coat of paint. 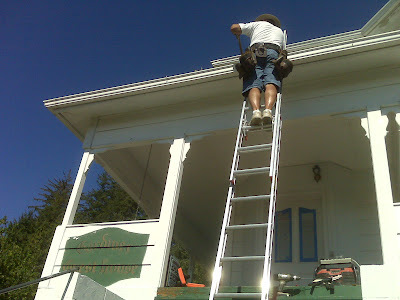 There were some issues with the roofing and drainage, so we called in our roofing contractor to do the repairs on top. The gutters had to be removed during the process. Happily, the gutters were salvaged and rehung. Consider It Done Construction fixed the dry rot and replaced the decking on the porch, then repaired the steps up to the house. The customer requested that the porch swing be painted, too. It was the perfect finishing touch. This picture was taken just as the electrician arrived to re-wire the lighting. The little clock on the counter wasn't the only thing that stayed. 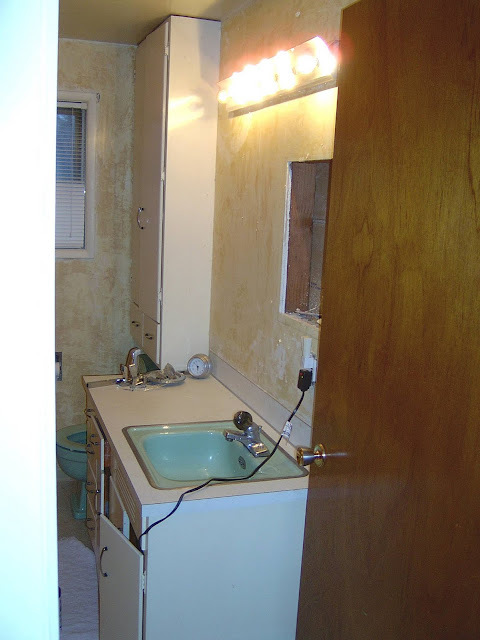 The cabinet over the toilet is original, as is the door and door hardware (We added the decorative trim to the door before painting). Two things were added after this picture was taken: a small piece of trim on the cabinet at the ceiling, and a ceiling fan. 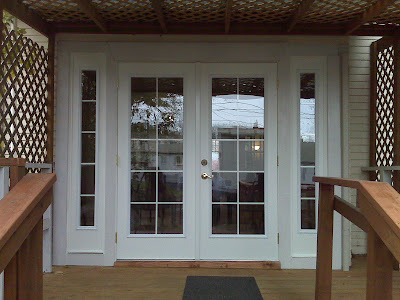 The customer wanted french doors installed here to create a private conference room. 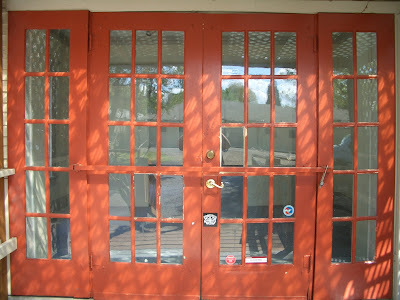 The near set of doors is new, the far set of doors is original to the building. The door sets swing opposite directions because of the limitations of the space. 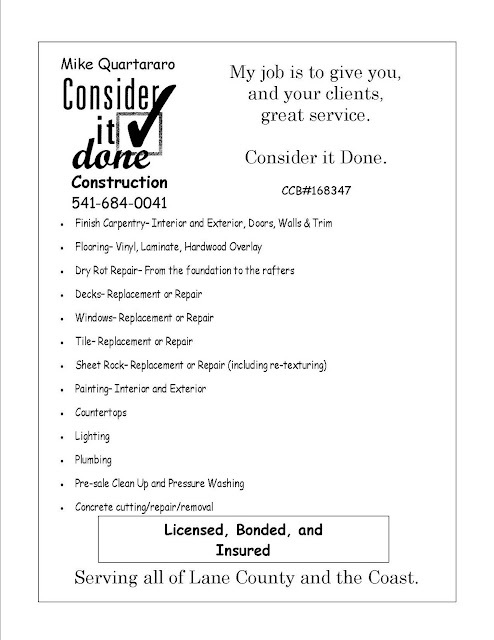 Consider It Done Construction also did the painting, and worked with a flooring contractor to coordinate installation of the carpeting. This old door was the main entrance to a small business. Replaced with double paned vinyl, and the existing lock set. First impressions really do matter. Consider It Done Construction to add a new French door inside. See next post for Before and After pictures! This customer only had access to the backyard through the garage. So, we turned the kitchen window into a doorway. 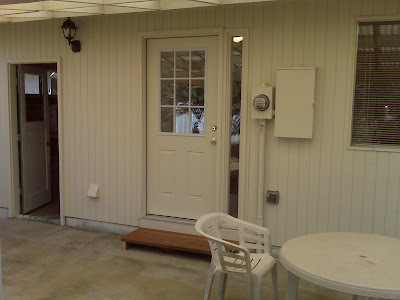 Deck and new fence panels added in preparation for sale of the home. 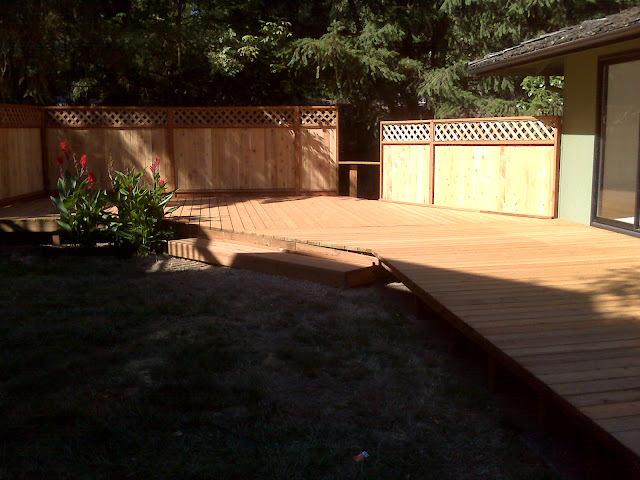 We designed the deck to work with the shape of the backyard, and existing landscaping. 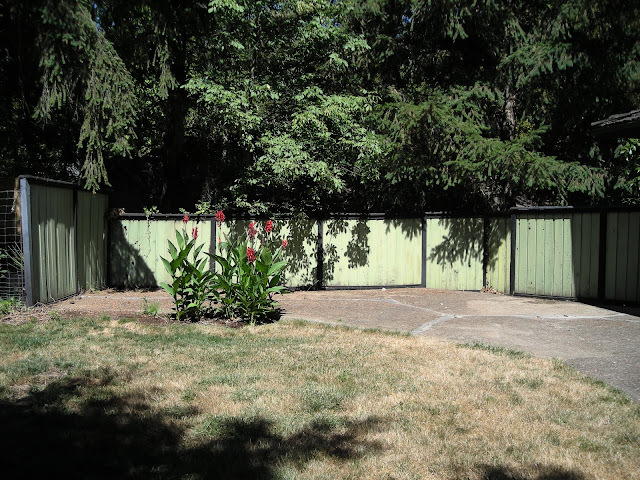 The new fence panels were modified to add privacy on one side, and give better access. 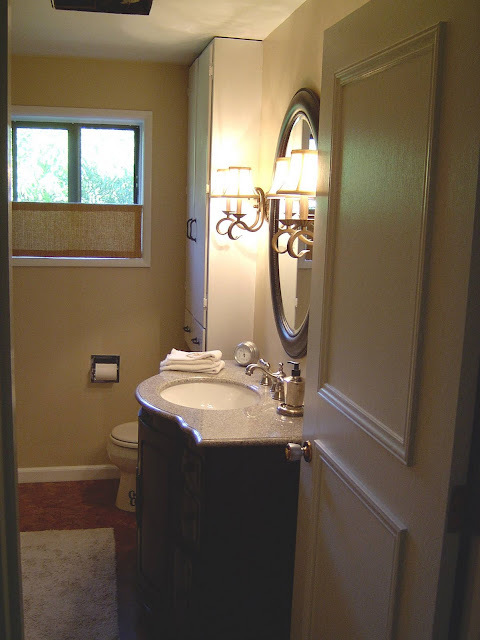 The customer wanted a bathroom remodel using the existing vintage tub, vanity mirror, window, and toliet. The plumbing needed to be repaired before the new floor could be installed. The customer selected all the new fixtures. My goal is to be more accessible to my clients. 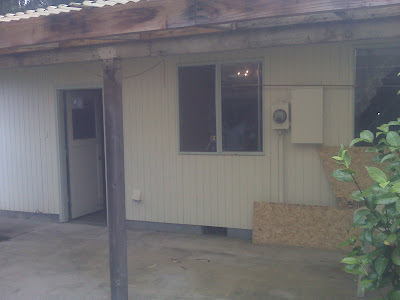 Please review the Before and After photos on this site from time to time, to get an idea of the services I offer. Example: give me a property inspection report, and I'll give you a line item bid for repairs.